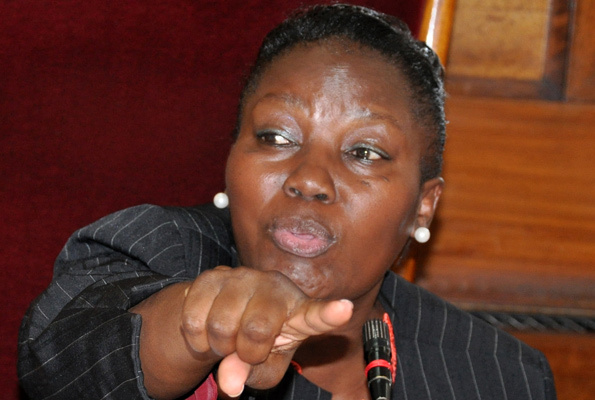 KAMPALA – Speaker, Rebecca Kadaga has asked those criticising her move to extend the tenure of the Committee of Commissions, Statutory Authorities and State Enterprises (COSASE) from running affairs of Parliament on the street. Kadaga made the remarks this morning while appearing on NBS Morning Breeze and her statement was in relation to the question asked on the debate on the extension of the extension of the tenure of COSASE Chairperson, Abdu Katuntu and his deputy Anita Among, COSASE Vice Chairperson. The Speaker wondered why the debate has been centred on COSASE alone yet there are other Committees that have sought extensions, yet no such criticism has been directed towards the said Committee. It should be recalled that on 14th August 2018, the Speaker instituted an eight-member select Committee headed by Robina Rwakojo (Gomba West) and other members; Gideon Onyango, Mary Kabanda, Stephen Kissa, Anthony Okello, Sarah Kityo, Joshua Anywrach, Mwine Mpaka and Godfrey Katusabe to investigate cases of sexual harassment in learning institutions. The constitution of the Select Committee followed the rampant cases of sexual violence in institutions of learning, that saw Ann Adeke (National Female Representative) table a motion on the floor of Parliament calling on Parliament to investigate cases of sexual violence in institutions of learning. Recently, Deputy Speaker Jacob Oulanyah also informed Parliament that the Committee of National Economy headed by former Finance Minister, Syda Bbumba has written to Speaker seeking to have its tenure extended to allow the Committee finalise on loan requests on their shelves. It was then that Jovah Kamateka, Chairperson of Human Rights Committee also noted that her Committee still has pending business, to which the Deputy Speaker asked her to put her concerns formally to the Speaker’s office. The debate on extension of COSASE tenure has been on for about four weeks after Speaker announced that the Committee’s tenure had been extended to February 20th 2019, a decision FDC protested and although the Party agreed to have Katuntu team conclude investigations into Bank of Uganda’s closure of the seven defunct banks, they sought to have the current team turned into select Committee. In a 15th January 2019 meeting, between Leader of Opposition and Speaker, the two parties agreed to have Katuntu’s tenure extended although the date was pushed to 15th February 2019 contrary to the 20th February that Speaker had earlier communicated. During the meeting, the Speaker also said that Parliament was ready to conclude the work that is before Parliament, although these few months, much focus will be put on the budgeting process.